Shopping season is upon us. For some holiday shopping is a chore and a headache, synonymous with long lines and baffling return policies. Well good news for the Grinches: the rise of online retailers like Amazon and Jet.com means you can take care of your gift purchases from the comfort of your couch, with a credit card and a computer. Try SmartAsset’s free federal income tax calculator. For those of us who are filled with the consumerist holiday spirit, however, the experience of buying gifts for our loved ones (and, let’s face it, ourselves) at brick-and-mortar retailers is irreplaceable. Indeed, the crowds on New York City’s Madison Avenue and Chicago’s Miracle Mile are clear evidence that the tradition of the December shopping trip is alive and well. But are these really the best places for your winter spending spree? Destination: Honolulu. If you have Hawaiian vacation plans for this winter, set aside a few hours to do some shopping. Tropical Honolulu ranks as the best city for holiday shopping thanks to its high concentration of shops and its relatively low sales tax rate. Catching all the (tax) breaks. 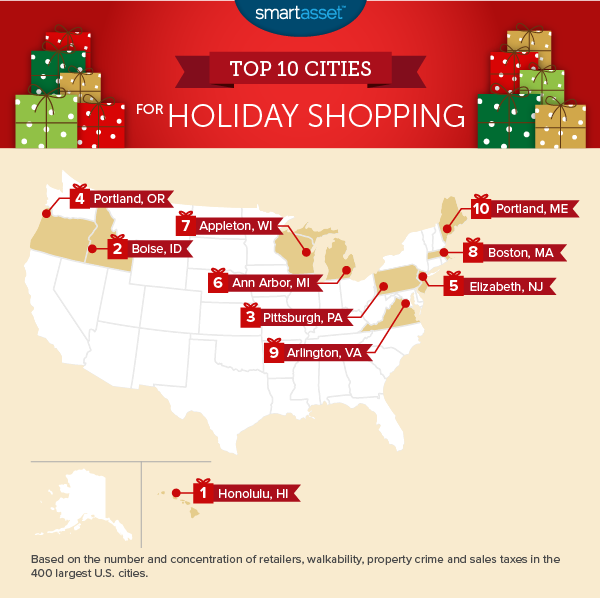 Many of the top cities for holiday shopping are located in states that either do not have a sales tax or provide special sales tax exemptions for clothing purchases. States such as New Jersey and Pennsylvania have special sales tax rules for clothing, while Oregon has no sales tax at all. What better place to spend the holidays than Honolulu? The city is an international vacation destination because of its beaches and tropical weather but if you need a break from the sun, a few hours of shopping may be just the ticket. There’s a lot more to be found than Hawaiian shirts in the malls and shops of Honolulu. Ala Moana, for example, is an outdoor mall with several department stores such as Macy’s and Bloomingdale’s and neighborhoods such as Chinatown have a wide variety of smaller shops. Plus, Honolulu’s general excise tax (which is similar to a sales tax but charged directly to the vendor) is 4.5%, lower than most sales taxes in the rest of the country. Those looking for a slightly wintrier destination may want to consider the Idaho capital. In Boise, the holiday season begins in early November with the opening of two holiday farmer’s markets and extends through December. Events include a winter window gallery stroll, Christmas movies at the Egyptian theater (including It’s a Wonderful Life – twice) and a free parking day on the Saturday before Christmas, in order to get in all of that last-minute shopping. Pennsylvania is one of several states that exempts all clothing purchases from sales tax, which could mean significant savings for shoppers in Steel City. For example, if you spend $200 on clothing in Chicago, which recently increased its sales tax rate, the added cost would add up to $20.25. Of course, taxes aren’t the only reason to do your shopping in Pittsburgh this December. The city gets into the holiday spirit with its Peoples Gas Holiday Market (modeled on the German Christkindlmarkt), the winter light and garden show at the Phipps Conservatory and Botanical Gardens and a giant ice rink at PPG Place. For those who truly dislike paying sales taxes, Portland is the place to be. The state of Oregon has no state or local sales taxes. Compare that to other west coast states: in California and Washington, sales tax rates can be as high as 9.5%. In addition to its 0% sales tax, Portland has a lot of great shopping options. Downtown Portland is home to major department stores including Nordstrom and Macy’s as well as numerous smaller specialty shops in the historic West End district. Then there’s Powell’s City of Books, which spans a full city block and contains more than 1.5 million books, truly a book-lover’s paradise. Find out now: Are store credit cards a good idea? Located just south of Newark Airport, Elizabeth is a hidden gem for shoppers in the New York City metro area. It is New Jersey’s largest Urban Enterprise Zone, which means many retailers can charge sales tax rates that are half the normal state 7% sales tax. Furthermore, New Jersey does not tax sales of clothing. Thanks in part to that friendly sales tax environment, Elizabeth is home to The Mills at Jersey Gardens, which is the state’s largest outlet mall. Elizabeth also has every bargain hunter’s favorite furniture store: Ikea. Ann Arbor’s charming downtown area is ideal for strolling and shopping. For those who want their gifts to be unique and memorable, small shops like Crazy Wisdom Bookstore, Elmo’s T-shirts and The Peaceable Kingdom should have what you need. Nickel’s Arcade is packed with upscale stores like Van Boven Shoes and Maison Edwards Tobacconist. Still not satisfied? Head next door to Bivouac, Ann Arbor’s homegrown adventure outfitter. Appleton kicked off the holiday season on November 24th with its annual Christmas parade. The festivities continue throughout December leading up to the Holiday Fun Fest on December 19th. The Fun Fest, located in Houdini Plaza, includes horse-drawn carriage rides, ice carving and even a visit from Santa himself. Appleton rates as a particularly good place for holiday shopping because of its low sales tax rate and high concentration of stores. 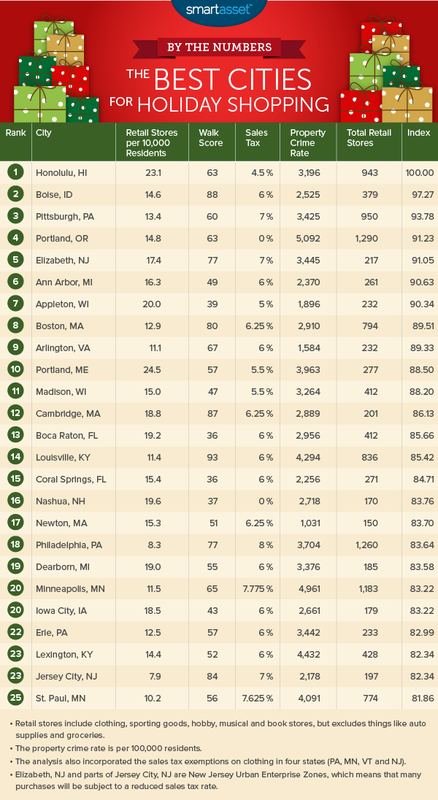 There are 20 retail shopping locations for every 10,000 residents in Appleton, one of the highest rates in the U.S.
Boston rates as a top city for shoppers because of its high walkability and relatively low sales taxes. While the general rate is 6.25%, clothing items up to $175 are exempted from all taxes. So that $150 cashmere sweater you’ve been eyeing? Sales tax free. If you have plans to spend time in the DC area over the holidays and want to get some shopping done, a field trip to Arlington might be worth your while. The city has several upscale malls and shopping centers, including Ballston Common and Market Common Clarendon. Arlington is also one of the safest cities in the metro DC area, with a property crime rate of just about 1,600. That’s less than half the rate in the capital. 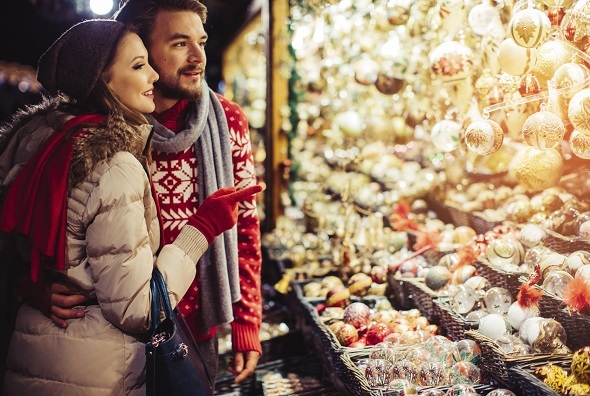 Located along the Atlantic coastline at the mouth of the Fore River, Portland is a great place to celebrate the holidays – and knock out some shopping. With 24.5 retail stores per 10,000 residents, it has the 11th highest concentration of shops of the 400 largest cities in the country. Maine also has a relatively low sales tax, with a state rate of 5.5% and no city or county taxes. Looking for a new credit card? Compare options with SmartAsset’s handy tool. Sales tax rate. Note: four states exempt clothing purchases on sales tax. In our analysis, we treated cities in these states as having a sales tax rate half that of the actual rate. So, for example, in Pittsburgh the total rate is 7% but when conducting the analysis we treated it as a 3.5% rate. Walk score. This is a rating of each city’s walkability, developed by WalkScore.com. Property crime rate. The number of annual property crimes per 100,000 residents. Total number of retail stores. This includes clothing stores, music stores, book stores, sporting goods stores and other types of hobby stores, but does not include things like auto supply retailers or grocery stores. Concentration of retail stores. The number of retail stores per 10,000 residents. We ranked each city according to these five factors and averaged those rankings, giving double weight to the local sales tax rate and single weight to all other metrics. Those average rankings were the basis of the overall rankings. The city that had the highest average ranking scored a perfect 100 and ranked first overall. Lower scores correspond to lower rankings across the five metrics in our analysis.